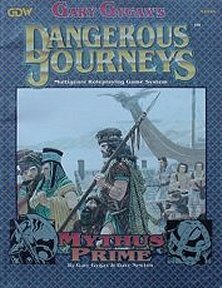 This is a simplified version of the full Dangerous Journeys/Mythus ruleset. Publisher's blurb: "Welcome to the Mythus Prime fantasy roleplaying game. There are wondrous worlds awaiting within - worlds of palace intrigue, subterranean adventure, places forgotten by time, and whimsical 'counter worlds' where winged sprites and monstrous beings of evil dwell. Swordplay and sorcery, dragons and giants, alchemy and conjuration, the counter world of Phaeree and the temples of demon-servers - all these things and more are just the turn of a page away. "The Mythus Prime game is based on fantasy, myth, and legend. If you've ever enjoyed reading Robert E. Howard, J.R.R. Tolkien, or myths and fairy-tales, then you have an inkling of what's in store for you within. Likewise, if you've found excitement in films such as Dragonslayer, The Three Musketeers, Excalibur, Conan The Barbarian, Robin flood, or The Thief Of Baghdad, then you'll find equal excitement in this game."